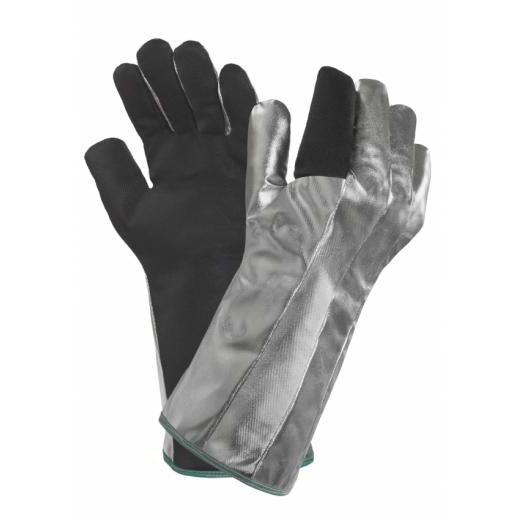 Manufactured from aluminised Kevlar and Preox, the Marigold Industrial Comaflame Heat-Resistant Aluminised Gauntlet Gloves provide excellent protection against contact heat – up to 500°C for 23 seconds – with good resistance to abrasion, cut and tear. Featuring a gauntlet-style cuff to shield the wrists and forearms against harm, these gloves are ideal for applications in metal fabrication. The Marigold Comaflame Gauntlet Gloves are manufactured from a combination of Kevlar and Preox, a textile blend that produces a glove that is non-combustible and provides excellent protection against contact heat. As a result, the Comaflame Gloves provide excellent thermal insulation, shielding against contact heat up to 500°C for 23 seconds. These gloves are available in one size only. Please consult the table below for sizing details. Please note that the gloves have a length of 400mm.